Sama Veda, Samveda, or Samaveda (Sanskrit: सामवेदः, sāmaveda, from sāman "melody" and veda "knowledge"), is the third of the four Vedas, the ancient core Hindu scriptures, along with the Rig Veda, Yajurveda, and Atharva Veda. According to Max Müller its earliest parts are believed to date from 1500 BC. It ranks next in sanctity and liturgical importance to the Rigveda. It consists of a collection (samhita) of hymns, portions of hymns, and detached verses, all but 75 taken from the Sakala Sakha of the Rigveda, the other 75 belong to the Bashkala Sakha, to be sung, using specifically indicated melodies called Samagana (Sāmagān is purpose of creation of Samaveda), by Udgatar priests at sacrifices in which the juice of the Soma plant (conjectured as Ephedra sinica), clarified and mixed with milk and other ingredients, is offered in libation to various deities. Jaimini divided the Veda into four, namely Rig, Yajur, Sama and Atharva. The histories and the Puranas are said to be the fifth Veda. Lord Krishna delivering Bhagavad Gita. Sama Veda:Lord Krishna, the divine persona of Gita, also says, of the Vedas, I am Sama. (10.22). Indra, Sama Veda:The singers of Gayatri celebrate you, Indra, lord of song and joy, with the hymns of Sama Veda. Sama Veda is the sum total of all that is pertaining to Samhita with a predominance of Rishi — observer value. Sama Veda represents the totality of the sensory systems and perceptual apparatus, including receptors, channels, pathways, and the structures involved in organizing, maintaining balance, and identifying and decoding inputs and information. The wakeful physiology receives all the flow of experience through these channels. They sustain the quality of flowing wakefulness. Prof. Tony Nader-Ram, in "Human Physiology: Expression of Veda and the Vedic Literature". The Sama Veda consists of hymns (many of them common with the Rig Veda) which when sung in the appropriate manner will strike a chord in enabling one to understand the universal truths and order of life depending on their stage of spiritual evolution. The source of the musical patterns of the Sama Veda hymns is derived from the vibration/sounds of the cosmos. This reveals that spiritual evolution can be achieved through music (by hearing as well as singing). The Sāma Veda is a collection of Sāma songs (a particular metre, which can be sung) from Rg Veda. There is no independent work in this Veda. The arrangement of its verses is with reference to their place and use in the Soma sacrifice. This Veda was handed over to Jaimini. He Jaimini divided the Veda into four, namely Rig, Yajur, Sama and Atharva. The histories and the Puranas are said to be the fifth Veda. Trayee: The three Vedas: The term 'tray', or triad, often used to denote the Vedas, is collectively applied to Rg, Sam, and Yajur. The Sama Veda represents the force of spiritual knowledge and the power of devotion. The book was revealed to Vayu rishi. It consists hymns of the Rigveda put to a musical measure. Hence the text of the Sama Veda is an alternative version of the Rig Veda. Its secret is in its musical annotation and rendering. If the Rig Veda is the word, the Sama Veda is the song or the meaning, and If Rig Veda is the knowledge, the Sama Veda is its realization. The essence of Sama is Udgitha, the cosmic resonance of Aum. That Aum, chant, sing and worship in meditation. Lord Krishna, the divine persona of Gita, also says, of the Vedas, I am Sama. (10.22). The singers of Gayatri celebrate you, Indra, lord of song and joy, with the hymns of Sama Veda. Sama Veda:With this mine homage I invoke Agni for you, the Son of Strength. The Samaveda, or Veda of Holy Songs, third in the usual order of enumeration of the three Vedas, ranks next in sanctity and liturgical importance to the Rgveda or Veda of Recited praise. The Collection is made up of hymns, portions of hymns, and detached verses, taken mainly from the Rgveda, transposed and re-arranged, without reference to their original order, to suit the religious ceremonies in which they were to be employed. There are three recensions of the text of the Samaveda Sanhita, the Kauthuma Sakha or recension is current in Guzerat, the Jaiminiya in the Carnatic, and the Ranayaniya in the Mahratta country. 1.With this mine homage I invoke Agni for you, the Son of Strength. Dear, wisest envoy, skilled in noble sacrifice, immortal, messanger of all. 2. His two red horses, all-supporting, let him yoke: let him, well-worshipped, urge them fast! Then hath the sacrifice good prayers and happy end, the heavenly gift of wealth to men. The mighty one lays bare the darkness with her eye, the friendly Lady makes the light. 2. The Sun ascending, the refulgent star, pours down his beams. together with the Dawn. O Dawn, at thine arising, and, the Sun's, may we attain the share allotted us! Vast is your sway among the Gods! Both Gods, devoid of guile, wax strong. A lofty seat have they attained. Saam Veda is considered to be the source from which Indian music has originated. A compilation of richas (shlokas) is known as "Saama". Richas form the basis of 'Saam'. The beauty of speech lies in the Richas, the beauty of richas lie in the 'Saama' and the beauty of the 'Saama' lies in the individual's capability to sing it. Saamaveda comprises of two main parts (i) Purvarchik (2) Uttararchik The middle portion is called Mahaanaam-nyaarchik, which itself comprises of 10 incantations. Purvarchik itself is sub-divided into 4 sections - Aagneya, Endra,Paavmaan and Aaranya. One gets divine peace while listening to the incantations of Saama Veda. Sama Veda: Agni is the deity, who shows us the (right) path. Agni is the deity, who shows us the (right) path. Agni blesses us with wealth. O Agni, Thou are great! Thou are the giver of happiness! Agni is the protector of the people and the destroyer of demons! O Agni! May you rise high like 'Suryadev' and be our provider! Agni is the lord of noble valiance and good fortune! Destroy 'people of hatred' with the help of knowledge. One who does not observe 'vrata' can never accomplish anything. A scholar with exceptional knowledge is successful in vanquishing all his enemies. Virtuous deeds make you great. One, who wears gems possesses wealth. Nothing can be achieved without enduring the 'fire of tapa'. The provider of food protects one and all. One, who is not a provider of food, I (God) destroy his food. Knowledge propagated by scholars helps even the lowest category of ignorant ones to attain supremacy. To attain salvation, tread on the path of progress. Sama Veda:Night-Night,the provider of rest and relaxation, is propitious. Night,the provider of rest and relaxation, is propitious. O Deities! May I never speak that which is against your dignity. May 'fame' never abandon me. The yagya enkindles the flames of consciousness in human's mind. Soma enthuses in us the enthusiasm to win. A truthful person's speech is as sweet as honey. Sama Veda:Deities never favour the lazy and indolent.Deities bless the diligent. Deities never favour the lazy and indolent. Avoid the company of those who abhor knowledge. Never listen to anything that is evil. Engage yourself in all that is auspicious. You fight a battle everyday. Having realized the truth, never become indolent. The scholar by his specialized knowledge and by making best use of his 'energy' attains the ultimate goal and supremacy. The propagator of truth...one who is always in touch with truth..accomplishes great deeds with the help of truth. Develop in yourself the capabilities to perform virtuous deeds. A radiant scholar (master) is worshipped. O Scholars! your good deeds have disseminated everywhere. Sama Veda:Thou are brave and benevolent. Enthuse 'desires' in humans. A warrior who is well equipped for the great battle with appropriate weapons acquires wealth. Sama Veda:Saraswati, the goddess of knowledge is worthy of eulogisation. Bless us with radiance! Give us happiness and good-fortune...bless us with benediction. Bless us with strength and power... Destroy our enemies and bless us with benediction. There are 10 characteristics of 'Dharma' - (1) Stability of mind, (2) forgiveness, (3) benevolence, (4) abstinence, (5) purity, (6) Control of senses, (7) intellect, (8) knowledge, (9) truth , (10) abstinence from anger. O Omniscient! fill the heaven and the earth with your divine radiance. O intelligent Vayu! Come to us embellished with all your qualities. One, who by the help of his 'knowledge',endeavours for the good of others, attains fame and makes rapid progress by the virtue of his capabilities. Those kings, who do not conspire against each other... they sit amongst their courtiers in the court of 1000 pillars. Imbibe the virtues of 'Vayu'. Just as the carpenter gives shape to wood, in the same way Agni (Fire) purifies us and blesses us with success in our endeavours. A person of self-restraint kills the demon 'Vala'. May we live the best life in this world. O Soma! May humans adhere by your rules. The knowledgeable,in order to attain divinity, defeats all the wicked competitors. We praise Agni, who assists in accomplishing 'Yagya' and who refines our intellect... one, who invokes the deities...the annihilator of 'enemies'...and the supreme motivator. Indra and Agni are the embodiments of joy. He makes the worthless, knowledgeable. While making endeavours to purify his self, the 'sadhaka' practices the rigours of 'Yama' and 'Niyama'. Thou are great just like all-capable deities. The efulgence of 'yagya' appears pleasing and mellifluous. Keep us under the shadow of thine valour and protection. The 'dawn' knows how to protect. May we contemplate upon you in each 'parva'(dawn and dusk). Help in accomplishing our 'Yagya' for the attainment of our long life. The devotee works assiduously to attain the wealth of salvation. Alike 'Dharma', 'yagya' too has a path. Protect your children with your own efforts. Thou are the vanquisher of enemies, irrepressible and mightiest. A 'sadhaka' after having purified himself, illuminates the 'Sun of knowledge' in the 'heaven of mind'. Those, who study the knowledge accumulated by sages, 'Saraswati' blesses them with milk, ghee, honey and water. May humans enjoy bliss by the blessings of the 'purifying and benedictory' richas. He eats pure food and attains immortality. O Agni, thou prevent the body from getting destroyed. 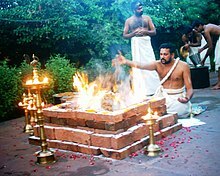 Sama Veda:O Agni, thou prevent the body from getting destroyed. Sama Veda:The great 'Surya' illuminates the heaven. Just as the performer of 'yagya' is blessed with prosperity ,May we too be blessed in the same manner. The great 'Surya' illuminates the heaven. The king, by following the path of 'truth', gets benefitted in a special way. One, whose path is all encompassing, protects us. May we be receptive to your supreme intelligence and become strong. Never allow us to fall prey to our pride. Thou are brave and benevolent. Enthuse 'desires' in humans. Just like Agnidev, who incinerates everything by His capability, in the same manner burn(destroy) the wicked and the ignorant ones. Realise the potential of the mind and then rule it. Saraswati, the goddess of knowledge is worthy of eulogisation. Savitadev, who inspires our intelligence, may we contemplate upon His radiant form. O Men! giving knowledge to ignorants, and forms to the formless thus rises the Sun after dawn. Agnidev, after having ignited the 'havan' and then inspiring us to perform the 'rituals', keeps on moving upwards efficiently. Great, brilliant and men of capabilities inspire us. The 'donor' sees the immediate fruits of his benevolent deeds. Agnidev blesses the 'donor' and the performer of 'yagya-karma' with 'wealth of reputation'. Bless people with the light. O Agni! Protect us from people of diabolic tendencies and miserliness. A scholar by his effulgence of knowledge, shines everywhere. O Agni! May you destroy all the diabolic forces one by one. Having taken your refuge, May we neither fear nor get tired. A scholar's fingers, by being constantly engaged in activities, acquire immense capabilities. O Agni! May thou not keep us away from 'battle'. Just as a labourer lifts loads!May thou prsented us the accumulated wealth, in the same way. A 'Gyani' treads on the path of truth. This page was last edited on 15 December 2016, at 23:25.